Mark your calendars. 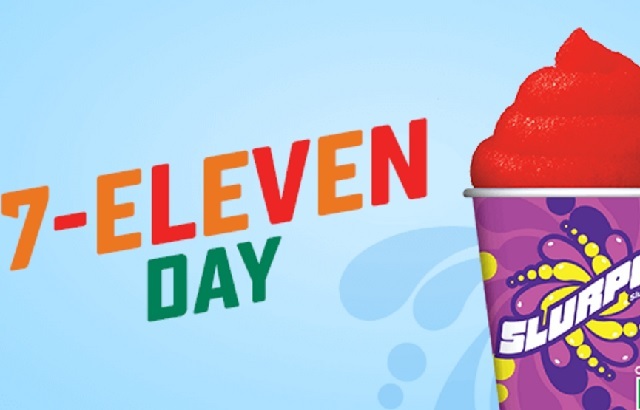 For the past 15 years, 7-Eleven has celebrated its birthday by giving away millions of free small Slurpee drinks on 7-Eleven Day, or July 11 (7/11) and 7-Eleven will be giving out free Slurpees this year on Tuesday, July 11, 2017. To celebrate 7‑Eleven’s 90th birthday, participating stores will give away an estimated 9 million free small Slurpee drinks from 11 a.m. to 7 p.m. local time on Tuesday, July 11, 2016, while supplies last. In 2017, 7-Eleven Day offers Slurpee-loving customers a chance to try new or featured flavors for free, like this summer's new cotton candy Slurpee flavor.